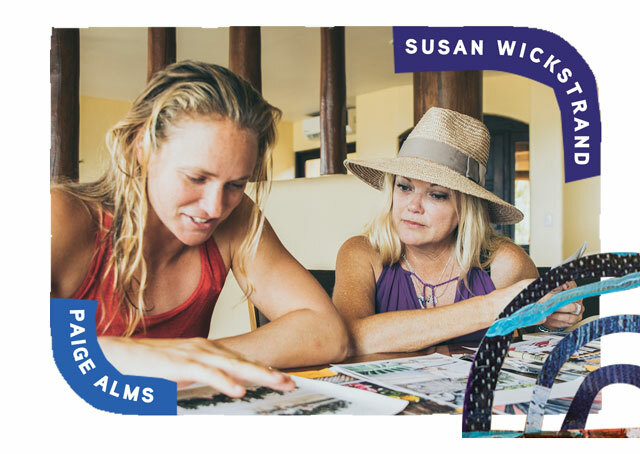 Once upon a time in Mexico Paige Alms, Cori Barnick and Jaysea DeVoe teamed up to celebrate their favorite things--surfing, yoga, photography, stoke and wellness--by making live, on-the-spot creations with the Queen of Collage, Susan Wickstrand. Join these fearless females as they cross-step the line between life as art and art as life. SANUK: You're recognized worldwide for your wondrous collages. What draws you to that medium? SUSAN: I’m trained professionally as a fine art painter. I specialize in seascapes and ethereal landscapes. But one day I walked into a gallery and saw a series of dreamy paintings that had a layer of clear wax on top of them, which diffused the details. So I took aclass from R&F Encaustic Paints out of New York on how to apply this wax medium and Bam! A lightbulb went off and everything clicked. I fell in love with it! Encaustic was the missing piece to a puzzle of tools in my growing art toolbox. To learn how to use this tricky technique in class, we’d simply make quick collages in our workshop with paper, photos, bookmarks, matchbooks—anything paper-based—to get an image down quickly; and then we’d apply hot molten wax atop the layers to seal them together. Then we’d re-fuse this wax (and its streaks) back into the artwork with a heat gun (the kind that removes wallpaper). So, in my mind, collage and wax seem to go hand-in-hand. I don’t really know anyone else (yet) doing it exactly like I do, and I think that’s pretty cool. SANUK: What or who most inspire your works? SUSAN: I’m super inspired by creative people, and those that live life to the fullest—the ones who squeeze every drop out of the day, and who have a nice balance of work and play. I’m also inspired by people with a great zest for life, whether they’re teachers, musicians, surfers, professional athletes, friends or kids. Inspiration is all around each of us. Sometimes we just need to press pause, look around and catch it. Albert Einstein, Steve Jobs, Mother Teresa, Rumi, Gandhi and Rilke have some of my favorite quotes about life. I’m always hungry to learn more and an avid reader of biographies on the above, or I love to watch films about interesting people and places. Travel is also a deep part of who I am. I really love other cultures, meeting new people, and absorbing bits and aspects of travel into what I do. My favorite collage artist is Peter Beard, but I like to do things more my way (more upbeat and positive), and in my own voice. SANUK: Tell us about your creative process. SUSAN: I think my best works are almost created intuitively and accidentally. For example, a new piece I made of fellow Sanuk ambassador Jaysea DeVoe includes her riding a wave (shot from behind), and then she’s got black and white wings of a lunar moth collaged onto her back. Those wings were a random occurrence. A creative accident, if you will. I was completing the collage—I had just laid down images that were a metaphor for waves on the far left—when I looked down to see what was on the floor and, upside down, was a pair of wings I had cut out at another time and for another purpose—but they fit perfectly! That’s what I’m talking about. Now, of course, sometimes I make bad art, too. Some days I gotta make not-so-home-run pieces in order to get the good ones out. It’s just like life, we just keep moving and stay out of the results. SANUK: You played such an integral part in Collaging the Line. How was the vibe alongside muses Jaysea, Paige Alms and Cori Barnick while creating “live” art in Mexico? SUSAN: It was amazing! What a magical moment in time. They are such talented ladies. Each is so varied and different. Almost like a perfect collage. All of them surf so differently, and on land it was really fun to travel with them, to share laughter and fun. Meeting new people keeps me young and happy. The opportunity to create “live” art, on-demand— with fresh, daily images thanks to our talented photographers—was a dream. I had to pinch myself. I’ve made collages for surf brands before, but this was completely different. It wasn’t like using images that had been shot previously and sent to me via computers. I was there watching the photographs being taken, watching the girls surf and play, and it was awesome. I was right there, experiencing everything with them, and then I used those special backstories to add unique elements to their collages. SANUK: We’d love to hear a little about what you created for each woman, and why. Let’s start with Paige. SUSAN: If you know what a badass big-wave surfer she is, then you, too, might have been a little intimidated by her. But the thing is, she’s so chill and funny and fun. We hit it off immediately in the car ride from the airport to Saladita. So for her, I wanted something that incorporated the massive water displacement she can create slashing a wave, the balance and grace she exudes from flying on a foil board, and then big, powerful, collaged shapes cut like water to reflect her big-wave surfing. SUSAN: Jaysea DeVoe is a “Sprout.” Just like my favorite Thomas Campbell movie—which actually got me interested in collaging women in the first place. We shot Jaysea in front of her family’s home there—with a hat on, and her hands on her hips—which was passed on to our 12-year-old artist daughter, Chloe Grace, who then hand drew (on her iPad, in Procreate) a halo of sorts around Jaysea’s hat and a water droplet, all in white. Then we printed it out before the art baton was passed to me. I collaged in the stem of a flower for each member of her amazing family: Rick, Julie, Ryder, Fisher, Jaysea, and their two dogs. Then I created collaged flowers for her, which represent Jaysea’s strength and amazing personality. SUSAN: For her, I had to take some time to get to know her better. I didn’t want to collage her right away. Cori is a thinker, a planner, a talented blogger. She’s a mindful person and a beautiful surfer—like a ballerina—and a talented photographer. I could see what her eye is drawn to through her photography and Instagram page, and I wanted to respect her sensibilities visually. Therefore, I went for more muted tones, black and white, with pared down, geometric images. I really like a shot that my husband took of her one day after surfing. You can see a reflection of where we were that day (and where the Mexi Log Fest is held) in her red sunglasses. That kinda encapsulates some things for me visually, because she seems to reflect on people, places and things. 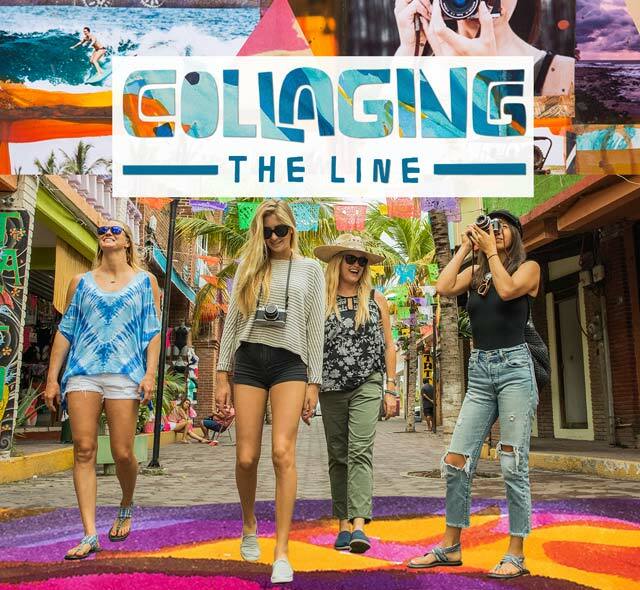 SANUK: What was your favorite part about the whole Collaging the Line experience? SUSAN: Getting to know everyone who was there. It was a magical moment in time—the weather, the ocean, lightning storms at night, swimming, surfing, sun, art, music, laughter and amazing homemade Mexican food, all while teaching the girls some collage and creating images that never existed before. That makes me smile. SANUK: What things make you smile and shine the most? SUSAN: The answer is simple, and in the order of importance to me: faith, family, friends and a passion for what I do. I think we get back what we put out there. Life is not perfect, things happen, but, honestly, perfection is boring. It’s the surprise of what each day may bring that keeps a bounce in my step. Meet the “Queen of Collage”, Susan Wickstrand. Born and raised in San Diego, Susanhas been a full time professional artist for over 25 years. A longtime friend of the brand, Susan’s ways are as smile-filled as they come. From oil and acrylic to encaustic (wax) collages on wood panels, Susan’s got a passion for all sorts of art mediums. Her beautiful creations have been shown extensively throughout the U.S. and abroad, including the legendary Greenroom Festival in Japan. Some of her pieces can even be found on the walls of various T.V. shows like ABC's “Modern Family”, NBC's “Parenthood” and MTV’s “The Real World”. Her bestselling images featuring her artwork can be found globally on iPhone cases, hats, pouches, apparel and more. Susan’s work can be found at Greenroom Galleries in Hawaii & Japan and Bliss 101 in Encinitas, CA as well as her online store.